“Perfect Christmas Bird Count weather in Ottawa: -32C and 20-25cm of snow. Fun times, fun times,” remarked Gillian Shields on Facebook, as she set out for a day in the cold. She and dozens of other area birders came out for the 93rd Ottawa-Gatineau Christmas Bird Count on Sunday, December 15. The annual event was organized by the Ottawa Field-Naturalists’ Club and the Club des ornithologues de l’Outaouais. During the day, over 100 observers spotted 67 species and over 15,000 individual birds according to the preliminary tally. The species count was below the 10-year average of 71.8 because of the early onset of winter this year; the cold, snowy and windy day; and perhaps the poorest winter finch numbers in a couple of decades. A low American Crow count – 3,743 compared with the usual 10,000 – also affected the total. Official results will be released early in the new year. Highlights included 2 Harlequin Ducks, a White-winged Scoter, and the first record of a Yellow-Bellied Sapsucker. The day also saw an all-time high of 9 Snowy Owls. 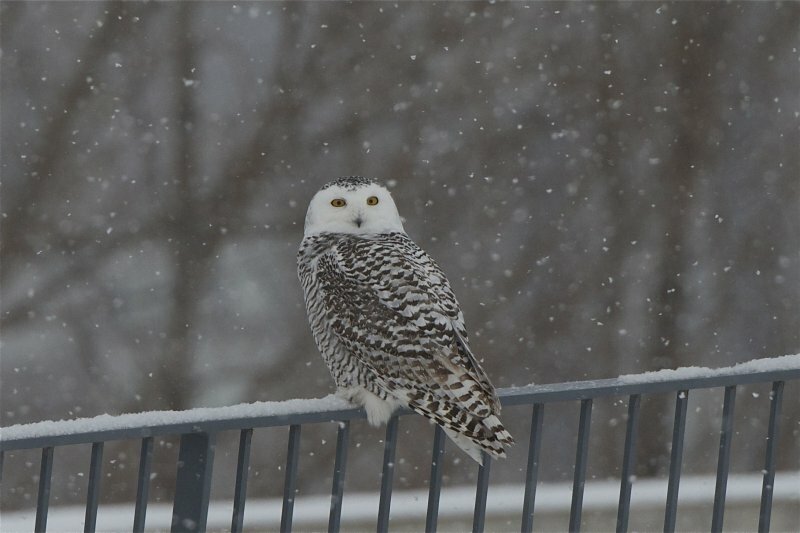 One Snowy Owl was spotted downtown battling a Peregrine Falcon (see story below). A big thank-you to the Club des ornithologues de l’Outaouais for hosting the after-CBC dinner and tally. If Sunday’s stormy weather kept you away, here are some other Christmas Bird Counts that you can join: Bird Studies Canada’s location finder. Bird Studies Canada is also looking for feedback on the Christmas Bird Count. If you want to participate visit the Bird Studies Canada website. Late in the afternoon, Jon Ruddy, Jeremy Bryan and I had yet to find the resident peregrine falcons, despite checking the Coats Building at Tunney’s Pasture several times. We decided to try the Delta Hotel at Albert and Lyon, their other favourite hangout. As we drove up Slater St., Jon spotted an enormous, heavily barred Snowy Owl that we had seen earlier in the day behind the War Museum. Now she was in the air, flying toward the downtown core. Sure enough, as we crossed Bronson, we saw Diana (our female peregrine) come flying around the corner toward the owl, which was now right in front of us. It all happened very quickly (as things do with angry peregrines), so I can’t be entirely sure of the sequence of events. Diana easily caught up with the now-panicking owl over an empty lot on the south side of Slater. It took a hit, scrambled for a foothold on the side of an apartment building, tumbled down, and finally found a perch on the edge of a balcony. But the falcon continued to attack. The owl took off again and disappeared somewhere behind us, with the falcon still in pursuit. And she did. Our heart rates back to a manageable speed, we continued on Slater, up Kent, and back along Albert to see if the male peregrine was at the Delta. No sign of him, but we didn’t really care at that point. As we continued west, we saw the owl again. She appeared uninjured and was flying south – hopefully not toward the other resident peregrines at Confederation Heights!